Look for the Orange and Blue Balloons!! There's free parking all along both sides up and down Montrose Dr.
Feel free to bring a dish to share as a welcome addition to our meal but it is not required for you to attend. You might also want to bring chairs and blankets to ensure yourself of "comfortable" seating arrangements. contact us at midwestnarcolepsy@gmail.com or gridles13@hotmail.com with questions or any special requests. If you need someone to give you more explicit directions or to meet you at the Bait Shop to make sure you get to the picnic spot, let us know. Also, if you could just touch base with someone to letus know that you are coming so we are sure that we have enough for everyone, it would be appreciated. SEE YOU AT THE PICNIC!! From I-94 E. Take exit 41B to merge onto US-14 E/N Caldwell Ave/W Peterson Ave toward 6000 N. Continue to follow US-14 E/W Peterson Ave for 4.3 mi. Take a Slight right onto N Ridge Ave in 0.8 mi. Take a Slight left onto W Bryn Mawr Ave in 0.3 mi. From I-90 E. Take exit 44A for Keeler Ave toward Irving Park Rd/IL-19 in 0.2 mi. Keep right at the fork, follow signs for Illinois 19 W and merge ontoKennedy Irving Park Road in 436 ft.
toward Lake Shore Dr/Stevenson Expy N for 1.3 MI. 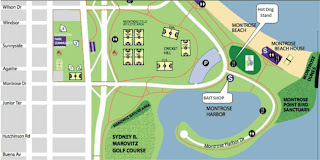 Take the U.S. 41 S/N Lake Shore Dr exit on the left for 0.5 mi. Take the Montrose Ave exit in 0.1 mi. August Meeting -- Room Change Notice!